Randolph, New Jersey - ROVVER X can now inspect more pipe sizes than any other crawler on the market, thanks to a new bolt-on carriage that raises the crawler, expands its wheelbase, and gives it unmatched ground clearance. The carriage attaches in seconds, and accepts all ROVVER wheels, as well as two new pneumatic wheel options. When used in tandem with the system's remote camera lift accessory, the carriage gives ROVVER X an overall inspection capability of 6-72", plus the ability for centered viewing in most common pipe sizes 24" and larger. 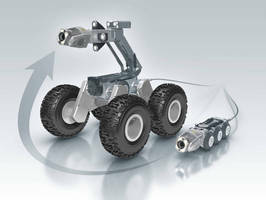 It elevates the crawler at least 4.4", or considerably more when upgrading to pneumatic wheels. It lengthens the crawler's wheel base 75%, widens it 150%, and grants up to 7¾" of ground clearance. ROVVER X's ultra-powerful motors and efficient gear drive train make such an accessory possible-even with the carriage installed, ROVVER X can still pivot in place and easily pull the full length of its 1000' cable. The carriage is available with two large pneumatic wheel sets, each of which can only be accommodated by the carriage's longer wheel base: One style measures 10.4" diameter by 3.8" wide and has knobby tread suited for deep silt and debris. The other style measures 8.4" diameter by 2.2" wide and has slightly less aggressive tread. "When we set out to design ROVVER X, we wanted a single crawler that could transform to meet any inspection challenge," says Richard Lindner, President of Envirosight. "This new carriage fulfills that ambition, allowing a ROVVER X user to inspect the full range of pipe sizes found in municipal infrastructure."